I've been doing lots of the on-line challenges rather than making cards with ideas I have whirling around in my head. Today I decided it was time to get back to more of just making whatever comes to me. Here are the results ... Hope you like. 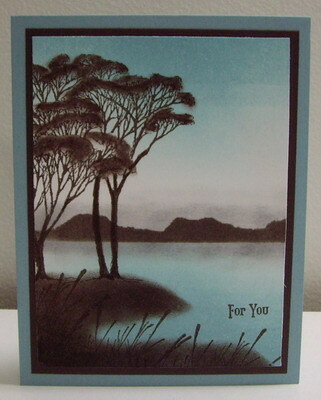 "Misty Morning at the Lake"
Stamps: Sketch of Nature (trees), Birch Tree Paintings (grass) - Innovative Stamp Creations (ISC); Vintage Labels (sentiment) - SU! This is a very simple brayered card, done as follows: I masked the horizon line with a post-it note, covering the sky area with the mask. I brayered Baja Breeze from the bottom up to the mask. I removed the mask and brayered Baja Breeze from the top down about 1/3 of the way, leaving a white space in-between the sky and the water. I placed the post-it note mask back on the horizon line, this time covering the water and then randomly ripped a scrap piece of paper to create the mountains in the distance (low range). I placed the ripped mask covering the sky and used the brayer to add Early Espresso ink for the mountain range, re-inking the brayer and going over it several times to make it as dark as possible. I removed all the masks. I stamped the tree in Early Espresso ink on the left hand side, about 1/2" or so below the horizon line. I used the Stampin' Write marker to fill in the trunks of the trees and make them dark. I used a small eye-makeup sponge to add ink to the "leaves" of the trees. And, I sponged ink around the base of the trees and down the left side and most of the way along the bottom to create the bank of land along the lake. I sponged Basic Gray lightly along the tops of the mountain range and also underneath the range in the water. I stamped the grass several times along the bottom of the card in Early Espresso ink and stamped the sentiment on the right hand side. Labels: all occasion, brayering, ISC, sponging, Stampin' Up!